ATI is a nationally-recognized rehabilitation provider, specializing in research-based physical therapy, workers’ compensation rehab, employer worksite solutions, sports medicine, home health, and a variety of specialty therapies. An official ballot drop box is located outside of the south entrance to the main Crossroads building, between Pier 1 Imports and ATI Physical Therapy. Shop Bed Bath & Beyond for bedding, bath towels, kitchen electrics, cookware, window treatments, storage items, gifts and much more! Bellevue's premier florist! Always friendly, always here to help you with a smile. Bellevue Crossroads Florist has been serving the Puget Sound area's floral needs for generations. Providing timely and courteous service, we deliver only the freshest flowers. Whether you're celebrating a friend's birthday, thanking a valued client, or simply brightening someone's day, let us help you express your words and emotions with the classic gift of flowers. We are happy to assist you with your out-of-town or out-of-the-country flower deliveries. Crossroads Mini City Hall is a neighborhood service center extending city services and community connections to East Bellevue residents. A fully equipped satellite office inside Crossroads Shopping Center, the Mini City Hall specializes in personalized customer service and outreach to Bellevue's diverse population. Service is provided in nine languages, and staff is available to provide information and assistance to visitors. At Bel-Red Auto License, we offer vehicle and vessel licensing services such as Washington State license tab renewal, Ownership transfers and Registration for out-of-state vehicles and vessels. Most major credit cards accepted. ATM in our lobby. *** Bel-Red Auto License is still at Crossroads, but we have moved. Visit us in our new location on the east side of Crossroads, two doors down from the KCLS Library. Looking for a local dentist you can trust with your smile? Visit the BrightNow! Dental team at Crossroads Bellevue. Our skilled dentists and caring staff look forward to helping you with routine dental check-ups, X-rays, cleanings and fillings, braces, dental crowns, dental implants, tooth extractions, root canals, dental bridges and dentures. We also love to brighten smiles with affordable cosmetic dental services such as in-office and take-home teeth whitening, bonding and veneers. Brow Arc offers eyebrow and facial threading. Become a member & save! Crossroads Bellevue is home to a collection of vintage 25¢ kids' rides, including a carousel, helicopter, race cars, rocket, speedboat, elephant, and more. We are a leading global financial services firm with assets of $2 trillion. We have more than 200,000 employees. We are a leader in investment banking, financial services for consumers, small business and commercial banking, financial transaction processing, asset management and private equity. We're doing our part to move the nation forward. Learn more about The Way Forward. A Community Bulletin Board is located in the hallway between Candy Tyme and Paris Miki Optical. Space is limited; therefore priority space is made to non-profit organizations for advertising community events. All postings must be approved in advance at our Guest Services office. The Crossroads Community Room, located in the hallway next to Old Navy, is available to individuals or groups in need of a facility to host a meeting or function. The room can accommodate up to thirty people. It is available on a first-come, first-served basis. There is a small rental fee for use of the room, and a discount is available for 501(c)3 non-profit organizations. Top quality furniture, affordable home decor, imported rugs, curtains, unique gifts, food, wine and more - at the best values anywhere. We are a contemporary ceramic studio offering a wide variety of paint-it-yourself ceramics. We have a large selection of unfinished ceramics to choose from and our friendly staff will help you create a unique one-of-a-kind piece of art. Great prices on haircuts and services for men. We do Line-Ups, Mo-Hawks, Fades, Flat Tops, Shave cuts, and more. At Crossroads Physical Therapy, your Physical Therapist will create an individual therapy program that is specifically developed for you based on a complete evaluation of your condition. Our rehabilitation philosophy is to promote healing through a combination of exercise and manual therapy, as well as to educate our patients in injury prevention, body mechanics and self-help techniques. We aim to provide you with the best physical therapy experience in Bellevue. Currently accepting new patients! Same day appointments available. We provide the finest veterinary care available according to standards established by the American Veterinary Medical Association and the Washington State Veterinary Medical Association. Crossroads Vet maintains an open environment that allows pets and their owners discretion in treatment with access to consultation and referrals. Originators of the "No Judgements" philosophy, Crunch Fitness is a different kind of gym. Featuring a diverse selection of high-quality home goods products that are recognized not only in Japan but around the world. Daiso's mission is to help customers find surprises and fun! Offering a wide selection of sports gear, equipment, apparel, and footwear. Get the top brands at competitive prices. Casual, career, and special occasion fashion apparel and accessories at value prices for women ages 35-55. Find your style solutions with our on-trend clothing and designer collaborations. Text JOIN to 21226 to sign up for mobile offers and get 20% off any single regular price item, or sign up for emails at dressbarn.com and get 20% off any single regular price item. For over 94 years, we have built our reputation as a provider of financial solutions, concierge of professional connections, and a partner in community service. Offering a huge selection of more than 10,000 games, systems and accessories per store for Atari 2600, Intellivision, NES, SNES, Genesis, Dreamcast, Playstation, Saturn, 3DO, Turbografx-16 and many more! Plus, we have the largest selection of video game related items as well such as books, tshirts, keychains, candy, stickers, etc. We pay cash or store credit for all trade ins. Buy, sell, and trade your favorite classic video games at Game Over Videogames. We are the world’s largest video game and entertainment software retailer. We offer customers the most popular new software, hardware and game accessories for next generation video game systems and the PC. In addition, our used game trade program creates value for customers while recycling products no longer being played. We buy and sell anything printed or recorded except yesterday's newspaper. Preserving and recycling resources and entertainment of every form is our business. Offering massage, facials including LED phototherapy, microdermabrasion, peels, and hair removal in a luxurious spa environment. Available massage services include deep tissue massage, prenatal massage, Himalayan salt stone massage, Hot Stone massage, and more. Hand & Stone also carries a full line of Dermalogica® and ClarityRX products to complement our facial services. Open 7 Days - Extended Hours - Walk-ins Welcome. Look and feel your best....affordably. Online booking is now available at handandstonebellevue.com. A 10% discount on services and memberships is given to first responders, military personnel, and veterans. Specializing in dry cleaning, alterations, and comforter cleaning, Heidi's Cleaners has been serving Bellevue for 25 years. Immediate Clinic treats everything from cuts and bruises to fractures and colds. As a state-of-the-art urgent care center, they offer on-site labs tests, x-rays and prescriptions - all with no appointments needed. First in Fabric and the Best Craft Choices; these words express the core of what makes Jo-Ann Fabric and Craft Stores® so exciting. Why is Jo-Ann the unique resource that it is? It starts with the great product selection in our stores and on Joann.com® and only gets better with knowledgeable customer service, a clear focus on value, and an unmatched opportunity to connect with a vital creative community. With all it has to offer, Jo-Ann is truly the place where America's sewers and crafters shop, discover and learn! A King County Public Library location offering a full range of features and services including books, music, movies, magazines, downloads, databases, websites, answers, and more. Mattress Firm is a different kind of mattress retailer; focused on creating a unique shopping experience with a large selection of quality, brand name bedding products, competitive pricing and knowledgeable, well-trained associates. Michaels is the largest specialty retailer of arts, crafts, framing, floral, wall decor, scrapbooking and much more. For over 60 years, Miracle-Ear has been delivering the highest quality hearing aids available. We offer top-notch services, including free hearing tests, fittings, personalized programming and aftercare for all of our hearing aid clients. We bring serious fashion fun to the whole family. We've got it all, from trendy threads to barely-basic basics, for everyone from newborns to adults. At prices that are oh-so-right! We offer a large selection of high quality sunglasses, prescription eyeglasses, and contact lenses, with an on-site lab and Optometrist. Our story began over 70 years ago inside a single retail store in Himeji, Japan. One day our founder gathered the store employees together and told them if he could only teach one thing then let it be this: "Always listen to our customer's voice and treat all people with kindness and respect." 70 years later, our founder's single store has grown to over 1,000 stores worldwide and can be found throughout the USA, Japan, Europe and Asia. 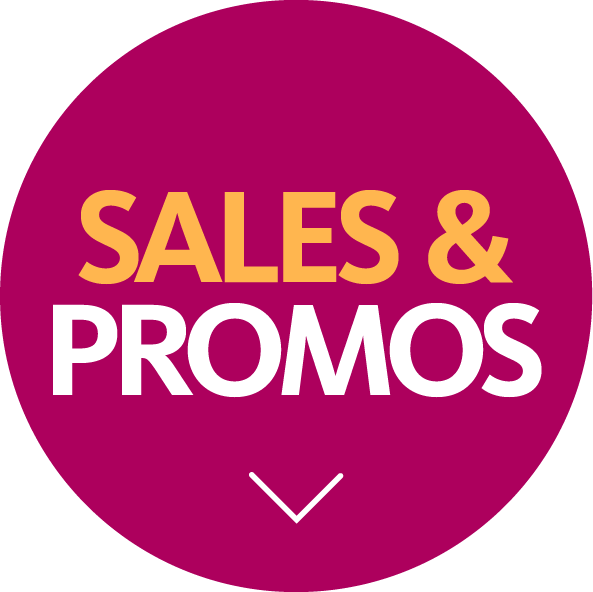 Your #1 source for discount birthday party supplies, Halloween costumes, and accessories. Find thousands of party favors, graduation decorations, and theme items. Party City is America's largest specialty party goods chain and the country's premiere Halloween specialty retailer. We are a locally owned Hallmark Gold Crown store. It offers a vast selection of quality products to help you celebrate life's milestones and everyday moments. The store features gifts, gift wrap and greeting cards, perfect for a relative, friend, teacher, co-worker, or maybe even as a special treat for yourself. Stop by around the holidays and pick up a dated keepsake ornament celebrating a new baby, new home or anniversary, or to find special holiday decorations for your home or office. Petco is a leading pet specialty retailer that provides the products, services and advice that make it easier for our customers to be great pet parents. Since our first store opened in 1965, our top priority has been to help more animals live long and happy lives with loving human companions. If it's interesting, if it's impressive, if it's colorful and cute and one-of-a-kind - then odds are it's probably from Pier 1 Imports. After all, Pier 1 has been the place for unique finds for over 40 years. Our buyers travel the world's major capitals and small villages hunting for the kinds of treasurers you can't find just anywhere - fresh and fragrant candles, exotic wicker, hand-painted dinnerware, gorgeous textiles and thoughtful handmade gifts. The focus is original. Everything has a global, artisan feel but the charm is always familiar. You'll see that each time you visit us. We display our selections so it's easy to locate all your favorites or discover something new and totally unexpected. For your convenience and peace of mind, we fill your bottle right in front of you and carry it to your car. Local office delivery is also available. We are located at the south end of Crossroads Shopping Center, near Michaels. Find low prices and a large selection of high quality goods and groceries including bakery, beverages, books & magazines, cheese counter, deli, general merchandise, floral, meat & seafood, natural & organics, olive bar, online deli/bakery ordering, salad bar, sushi, and much more. A brand new Indian shopping experience offering sarees, salwar suits, kurtis, and fashion jewelry. Sally Beauty Supply LLC began as one store in New Orleans in 1964. Today, Sally Beauty is the world’s largest retailer of professional beauty supplies. Sally Beauty Supply offers over 6,000 professional quality products for hair, skin and nails to retail customers and salon professionals. Our customers appreciate our knowledgeable sales associates who help them solve their hair and beauty frustrations. Sally Beauty has a heritage as the first choice for professional cosmetologists’ product needs because of the broad range of salon products and complete assortment of salon equipment. Our accessible locations make Sally Beauty an easy choice for the busy salon professional and consumer alike. We offer loyalty programs, such as the Beauty Club Card for our non-professional customers and the Sally ProCard for our professional customers. These cards offer discounts on every item in the store. 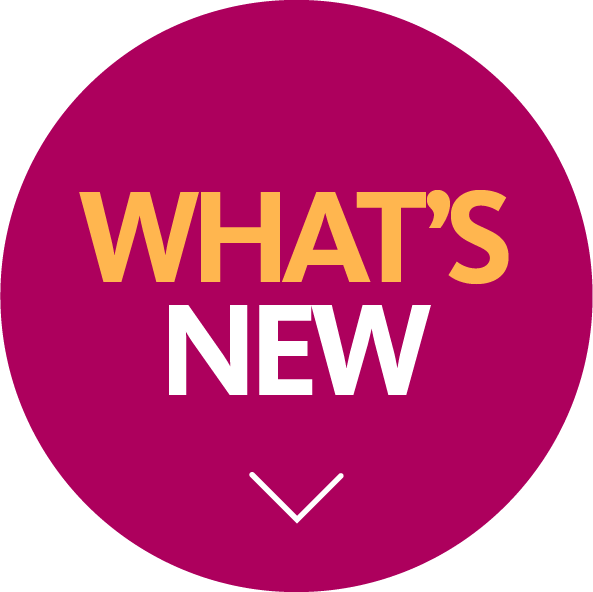 Members receive monthly e-mail newsletters with beauty tips, new product information and exclusive coupons. Apartment homes for Active and Independent Adults 61 or better (or 55+ with a disability). High quality nail and spa services at affordable prices. Fine Gold and Sterling Silver Jewelry, Natural Stone Jewelry, and Hawaiian Jewelry. Jewelry engraving, photo engraving, and jewelry repair. Layaway plan available. Extra discount given to senior citizens. Snip-its is a magical place for kids and a place moms and dads trust for great haircuts. Kids love going to Snip-its because there's so much to see and do, and parents feel great knowing their children are in good hands with our talented, kid-focused stylists. At Snip-its, We Speak Kid™ so everything in our salons is designed to make kids feel special and have fun. It's a place you and your child will love to experience again and again. When you're ready, so are we. We're a walk-in salon, so no appointments necessary. Just check in online to our wait list from home or right on your smartphone! Now save with a value pack! 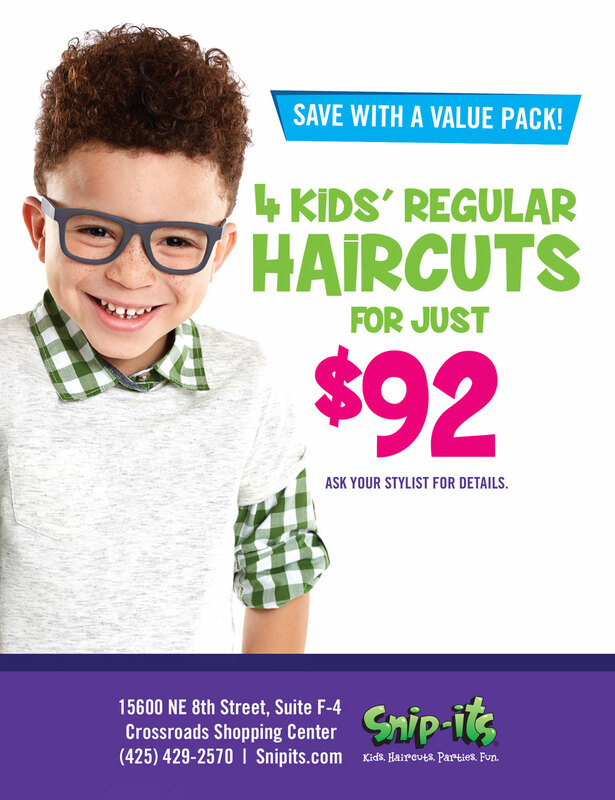 4 Kids' regular haircuts for just $92. Ask your stylist for details. Experience the finest climbing facility in the Northwest, featuring over 21,000 square feet of terrain for beginners through experts, including a fantastic kids area. Climbing 101, Technique Classes, Birthday Parties, Junior Programs, Corporate Affiliations, variety of memberships... and much more. The world's coolest and funkiest t-shirts! Offering fine art classes, birthday parties, art camps, and more. We offer a full range of shipping services through UPS® and other domestic/international air carriers. We offer a wide variety of delivery options from overnight to ground delivery. Contact us for service availability, pricing and/or scheduling. We also offer a full range of copy solutions. And we have Dasher, the dog! Ulta Beauty is the largest beauty retailer in the United States and the premier beauty destination for cosmetics, fragrance, skin, hair care products and salon services. Ulta Beauty has grown to become the top national retailer providing All Things Beauty, All in One Place™. The Company offers more than 20,000 products from over 500 well-established and emerging beauty brands across all categories and price points, including Ulta Beauty's own private label. Ulta Beauty also offers a full-service salon in every store featuring hair, skin and brow services. Ulta Beauty is recognized for its commitment to personalized service, fun and inviting stores and its industry-leading Ultamate Rewards loyalty program. Board games, card games, jigsaw puzzles, brainteasers - what fun!! WiggleWorks Kids is the original walk-in, indoor, completely soft-play, playground, party, and enrichment facility in the Pacific Northwest for children less than 48” in height. Our mission is to connect our community and promote a supercharged approach to staying active using our state-of-the-art playground structures that are all in MOTION! We are excited to provide children, infant through school-age, with endless opportunities to run, hop, play, giggle, and get those wiggles out! Now offering birthday parties and enrichment programs from Bricks 4 Kidz®. Children will enjoy using LEGO® Bricks to build specifically-designed models, play games, explore the world of engineering, and dip their toes into STEM. Watch this video to learn more about WiggleWorks Kids. *Regular hours may vary due to special events. Please check our Facebook page https://www.facebook.com/WiggleWorksKids/ or our monthly calendar: https://www.wiggleworkskids.com/calendars/ for the most up to date information regarding in-store events. **WiggleWorks kids Bellevue closes frequently at 5pm on Sundays to allow guests to celebrate birthdays privately. Primarily during the winter months, please check closing hours prior to your visit by calling us: 425-641-2186. Celebrate at the Northwest's only moving indoor playground.